Having his music supported by Armin van Buuren, Paul van Dyk, John Askew, M.I.K.E. 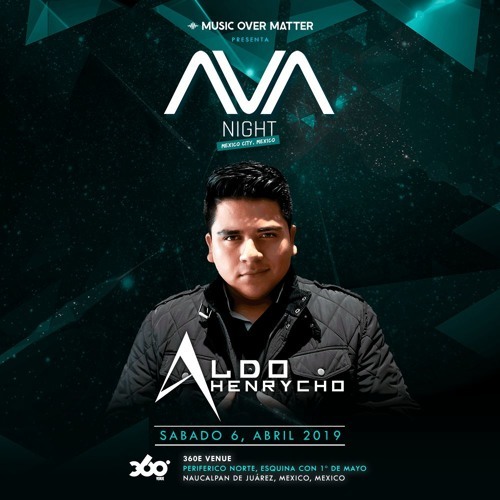 Push, Ahmed Romel, Ori Uplift, Alex M.O.R.P.H, Giuseppe Ottaviani, ReOrder, Kaeno, among others, Aldo Henrycho is with no doubt one of the future trance superstars from México. He is the CEO of one of the revelation record labels of the last year, Vibrate Audio, signing some of the hottest trance artists of the moment like Bigtopo & Omar Diaz, Aimoon, Derek Palmer, Hoyaa, Obie Fernandez, Black XS, Ellez Ria, Huem, Soul Lifters among others. The label got supported 6 times at A State Of Trance and 13 times on Future Sound Of Egypt shows in 2018. Aldo has been signed by some of the greatest trance labels at the moment, like Defcon Recordings, Abora Recordings, Alter Ego Records, Tangled Audio, Emergent Skies, Trance All-Stars Records, Beyond The Stars Recordings, Pulsar Recordings & many more. His track "We'll Be Okay", feat. Thea Riley, supported by Armin van Buuren on #ASOT835. Aldo hosts the radio show "ORIGINS", exclusively on the world's #1 trance station, AfterHours.FM, where he features only the finest quality on uplifting trance, and a second show "Trance In Flames", aired in Party103, Trance Energy Radio, Tempo Radio and multiple stations, featuring the best releases every week. Aldo is a Computer Systems Engineer. Alongside that, he's been a musician since 5 years old, and having skills in playing piano, guitar, flute, trumpet and drums.